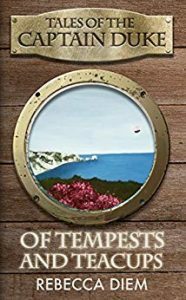 SF Canada member Rebecca Diem recently launched the fourth and final book in her Tales of the Captain Duke series, Of Tempests and Teacups. Rebecca will be attending Ad Astra this coming weekend and celebrating the book’s launch at 6 p.m. on Saturday, July 14, in Room 1086 at the convention hotel, the Sheraton Parkway North. Stop the Tradists. Save the Captain Duke. When the Captain Duke goes missing, Clara takes the helm to face enemies old and new. Torn between desire and duty, she must use her skills as both pirate and debutante to unite her allies and save the day. Even if it means facing her greatest fears—and returning to where it all began. Find out more about the series on Rebecca’s website.